Period., a multimedia exhibition on view at Rojas + Rubensteen Projects, challenges common misconceptions about menstruation and women’s bodies. MIAMI — Psychoanalyst Otto Fenichel once wrote of the menarche, or first period, “It is true that up to a certain point every unexpected emotional experience, especially if it is intense, may have a frightening effect until the ego becomes familiar with the new phenomenon…This also holds true for the first pollution or the first menstruation.” Helene Deutsch, another psychoanalyst, defined menstruation as “agitated periods during which previously repressed feelings are released.” Outdated, white psychoanalysts shouldn’t get to define the “meaning” of menstruation, but considering its continued associations with both taboo and an unfair societal repugnance, the period is still filled with narratives, a liquidy canvas upon which all sorts of ideas are projected. Menstruation can be a fairly mysterious bodily function. As of this month, I’ve had approximately 204 periods, and I still don’t fully understand my own cycle. According to Circe Dawn Sturm, a professor of anthropology and co-director of the University of Texas at Austin’s Native American and Indigenous Studies program, the Cherokee “believed that a woman’s menstrual blood was a powerful substance”; Pliny the Elder reportedly stated that, in the presence of a menstruating woman, “meat will become sour…and the fruit will fall from the tree beneath which she sits.” Speaking from a childhood full of Pagan undertones, some Wiccans like to water their plants with the stuff. But to describe it as “mysterious” seems like a function of the same thought patterns that got it associated with “pollutants” in the first place, and does no justice to its real physical and emotional complexity. The period is less mysterious than it is complicated, life-affirming, and subject to diets and medicine and weather; along the gender spectrum, not all women even get their period. Period., a multimedia exhibition on view at Rojas + Rubensteen Projects, is only about menstruation in the most basic sense. More broadly, it’s about the totality of women’s bodies, and how we — the ones living in them — understand ourselves and what it means to carry a womb (or not). The tradition of using period blood as an art material is not exactly new. In 1972, for instance, Judy Chicago filled her “Menstruation Bathroom” with blood and menstrual products. Art made with menstrual blood is almost never shocking because of its actual content but because of who, primarily, makes it: women. The reaction to the work is almost invariably visceral; it seems written off as pedestrian, juvenile performance art created for shock value or downright disgusting, particularly by men. Period., in its emphasis on the experiential nature of womanhood, blithely ignores its potential would-be detractors. 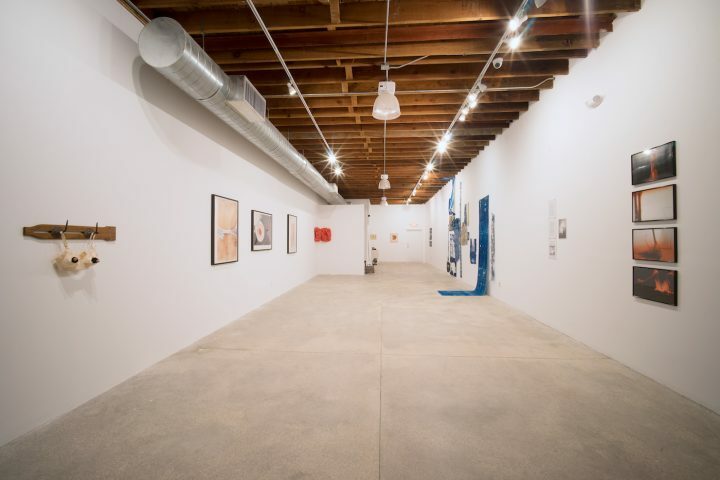 Of the show’s entirety, Jen Lewis’s photographs might deal with menstruation most directly. Her own swirling menstrual blood, shot in close-ups, is mixed with saltwater and freshwater, stirred with Q-tips and examined microscopically. The images’ strength lies not in their aesthetic impact — though the changes in the blood’s viscosity and texture are in a way beautiful — but in how Lewis uses her period to define her artistic process, with menstruation serving as the actual crux of her practice. Sonia Baez-Hernandez, a local artist on view, stopped menstruating when she got breast cancer. 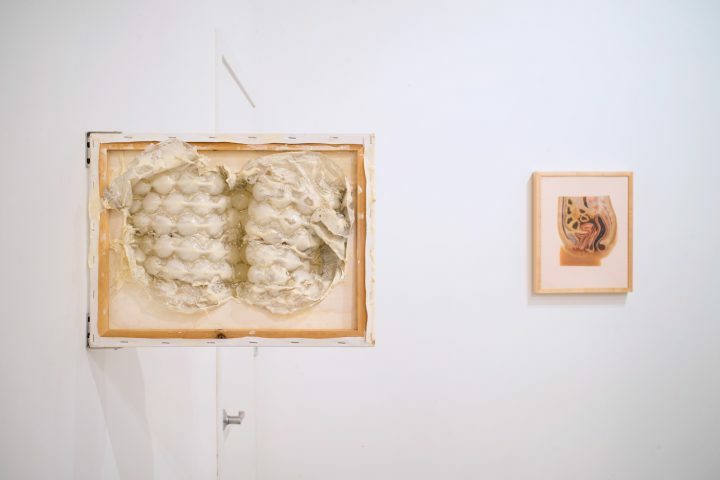 Her piece, “Reconstruction II,” a conical bra with small roses and soft, thick hair — the artist’s own, collected during a bout of chemotherapy — references the loss of her hair and, more specifically, the end of particular rituals conflated with femininity. In the language of imagination, fertility seems associated with wetness and ripeness; does the supposed drying of the uterus, the loss of brushable hair, or the medicalization of the body mean the loss of womanhood? Of course not — the feminine is less a straightforward schema than it is a multifaceted prism — but that’s not quite the point. In saving and reusing her hair, Baez-Hernandez, who has since recovered, raises questions about the ownership of our bodies and the ways we might reclaim them. Laia Abril’s “Illegal Abortion Procedure,” from her On Abortion series — part of an ongoing project entitled A History of Misogyny — depicts a lateral-view medical illustration of a uterus, obtruded by a needle-like apparatus that appears too thin and delicate to seem invasive in any other context. Abril’s project has long examined the pain and death associated with botched abortions, the shame implied by the procedure’s intermittent illegality. Those who control our wombs ultimately determine the type of pain we’ll endure, both bodily and emotionally. 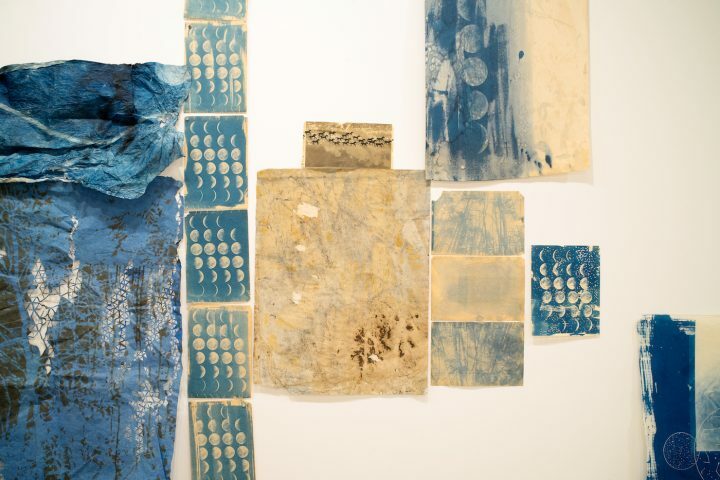 Emily Gui’s “How I Got Here,” a mostly blue-hued collage of cyanotypes and various media spanning nearly the length of a wall, feels rife with loss and life at once. There are photographic transfers of ropes and images recalling Ophelia, indigo-dyed fabrics, coffee filters bleeding into blueprints of bedrooms, the plus-or-minus symbols of pregnancy tests, uterus-shaped doodles, and the phases of the moon stretched out like a lunar calendar. Though it’s a hyper-personal piece heavy with symbolism — apparently there are parts of the work wholly obscured to viewers, known only to Gui — it is not impenetrable. There’s something cosmic about the work, both in its color and size, as if Gui might be making sense of her body in relation to the universe and to history. This sense of aching, though solely hers, is a historical, ancestral lineage belonging to women. Even if you don’t get a period, to identify as a woman is to hold a heavy mythos associated with your gender and your body. The artworks in Period. are a poignant and necessary reminder that we need to rewrite these myths ourselves. Period. 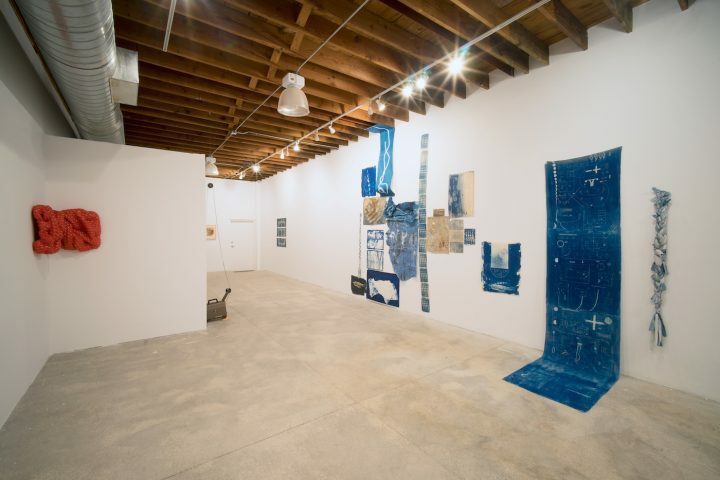 continues at Rojas + Rubensteen Projects (8051 NE 2nd Ave, Miami) through June 15.